What I really love about essential oils is that there are so many amazing uses for them. While it seems like a stretch when you're “new” to using oils to spend the money on such a little bottle, once you realize how far it can go it's obvious that they are worth it! There are just so many ways to use essential oils. They vary drastically in price range, but most of the ones I use fall in the $3-$10 range for a .5 oz bottle. That said, I love Aura Cacia, which is not one of the more expensive brands – you can definitely pay more than that, especially if you choose to use only organic oils – never something I would discourage! I think a lot of people are discouraged from using EOs because they think you have to buy an expensive kit just to get started – but that's just not true. One of my favorite oils – rosemary oil – runs me about $4 and lasts for months. I burn oils in a diffuser to make my home smell pretty and to take advantage of the aromatherapy benefits of different oils. I make household cleaners with them. I treat skin issues with them. I use them to ward off bugs and other pests in and around my home. I make bath and body gifts using essential oils. I use some of them in our hair care routine. Not as often as I did when I had dreads – but I still do! I use them to either relax or to refresh – depending on what I need to be doing at the time. I use them to treat minor wounds and ailments. 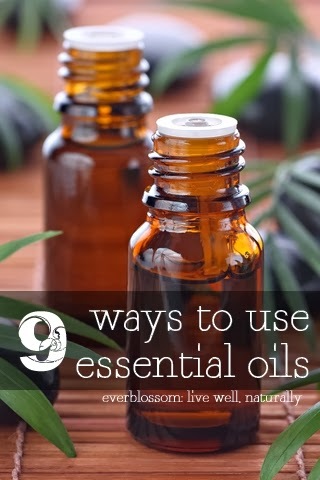 This list is by no means comprehensive of all the things you can do with essential oils, but these are my personal, regularly used applications. What about you – what are your favorite ways to use essential oils? Hi kindly give me remedy for stretch marks and dry skin. Avocado oil would be my first choice! I have heard that it is NOT safe to consume/ingest essential oils. Agreed, Amy! There are some extreme instances where it’s appropriate, but it should be done with the guidance of an aromatherapist. I don’t agree with using them simply as flavorings.